Centrally located and steps away from shopping, dining, and Boston Common, The Liberty Hotel sits at the foot of Beacon Hill. Guests have direct access to the Charles River Esplanade-ideal for running, biking, sailing and kayaking in warm weather. The Liberty Bar and Alibi serve light fare and the finest spirits. Chef Daniel Kenney's CLINK. specializes in American classics using fresh local organic ingredients and Scampo offers intriguing new Italian dishes by Chef Lydia Shire. Majestic skyline and river views can be taken in from the 298 guest rooms, including the 2,200-square-foot Presidential Suite and nine other suites. Rooms are adorned with impeccable style and bathed in natural light via floor-to-ceiling windows. CLINK. : CLINK. serves the freshest North Atlantic seafood, seasonal New England fare, and delicious heritage meats. The creative menu artfully marries European culinary tradition with contemporary American innovation. Scampo: Named one of the country's top ten chefs by Food & Wine, Scampo Executive Chef Lydia Shire has earned a reputation for defying tradition. Her daring Italian cuisine is globally influenced, drawing flavors from the Mediterranean and the Middle East. The Liberty Bar: Set in the 90-foot rotunda lobby, The Liberty Bar regularly draws a see and be seen crowd. The extensive cocktail list features house-infused liquors and whimsical ingredients such as locally sourced herbs, house-made bitters and muddled fruits. Alibi: Alibi s seductive space flirts with its history by hanging amusing celebrity mug shots on its walls, and features sophisticated cocktails and a coveted outdoor space. Alibi quickly has become a nightlife destination for Beacon Hill and Back Bay. Catwalk: Catwalk is a hotel-guest only retreat that is literally housed on a catwalk original to the Charles Street Jail and encircles the rotunda. 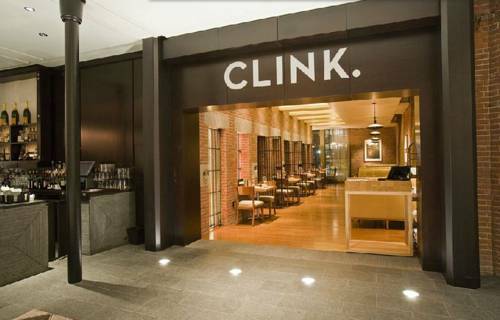 With dinner service and an upscale bar menu provided by CLINK., Catwalk provides unrestrained refinement. Fenway Park Tour "America's Most Beloved Ballpark"